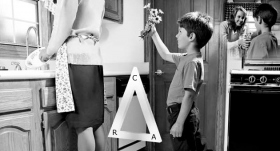 The third and most important corner of the ARC triangle is communication. In human relationships this is more important than the other two corners of the triangle in understanding the composition of human relations in this universe. Communication is the solvent for all things. It dissolves all things. How do people go into communication with each other? In order for there to be communication, there must be agreement and affinity. In order for there to be affinity, there must be agreement on reality and communication. In order for there to be reality and agreement, there must be affinity and communication—one, two, three. If you knock affinity out, communication and reality go. If you knock reality out, communication and affinity will go. If you knock communication out, they will all go. There are several ways to block a communication line (the route along which a communication travels from one person to another). One is to cut it, another one is to make it so painful that the person receiving it will cut it, and another one is to put so much on it that it jams. Those are three very important things to know about a communication line. Also, that communication must be good communication: the necessary data sent in the necessary direction and received. All that communication will be about, by the way, is reality and affinity concerning the physical universe. Discussions will be whether there is or is not affinity, or whether there is or is not agreement and where the agreement is particularly disagreed with on the physical universe. Affinity can be built up in a number of ways. You can talk to people and build up an affinity with them. But remember this is communication, not just talk. There are many, many ways to communicate. Two people can sit and look at each other and be in communication. One of the ways to go into communication is by tactile, the sense of touch. You can pet a cat, and the cat all of a sudden starts to purr; you are in communication with the cat. You can reach out and shake a person’s hand and you are in communication with him because tactile has taken place. The old-school boys with the tooth-and-claw idea that “everybody hates everybody really, and everybody is on the defensive and that is why we have to force everybody into being social animals” said that the reason men shake hands is to show there is no weapon in the hand. No, it is a communication. In France, Italy, Spain and so forth they throw their arms around each other; there is lots of contact and that contact is communication. If one corner of the ARC triangle is knocked out the remaining corners also get knocked out. Here, a child cheerfully approaches his mother to give her flowers. 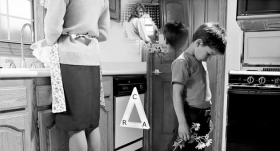 Preoccupied with housework, the mother ignores the child’s communication, which becomes knocked out, followed soon after by less affinity and less reality. If a person is badly out of communication and you reach out and pat him on the shoulder and he dodges slightly (he considers all things painful) even though he doesn’t go on, you will find he is also out of communication vocally. You try to say something to him. “You know, I think that’s a pretty good project, Project 342A, and I think we ought to go along with it.” He will sit there and look at you and nod, and then he will go down and complete Project 36. You say, “Project 36 has just been thrown out. We weren’t going to go through with that at all,” but he hardly knows you are talking to him. He dodges everything you say. Or he may talk to you so hard and so long you don’t get a chance to tell him you want to do Project 342A. That is dodging you, too. In other words, he is out of communication with you. Therefore his affinity is low and he won’t agree with you either. But if you can get him into agreement, communication will pick up and affinity will pick up. This is about the most important data run across in the field of interpersonal relations. You can take any group of men working on a project and take one look at the foreman and the men and tell whether or not these people are in communication with one another. If they aren’t, they are not working as a coordinated team. They are not in communication, perhaps, because they are not agreed on what they are doing. All the time you thought that those men thought they were grading a road. Not one of them thought they were grading a road. You thought they were building a road. Not one of them was building a road; not one of them was even grading. This crew may be unhappy and inefficient, but you get them together and you say, “Well, you know, some day a lot of cars will go over this road. Maybe they’ll wreck themselves occasionally and so forth, but a lot of cars will go over this road. You boys are building a road. It’s a pretty hard job, but somebody’s got to do it. A lot of people will thank you boys for having built this road. I know you don’t care anything about that, but that’s really what we are doing around here. Now, I’d like a few suggestions from you people about how we could build this road a little bit better.” All of a sudden the whole crew is building a road. Affinity, reality and communication go right up.